It is critical to the success of any new workplace design or redesign to first understand exactly how your space is being used. How often are your employees actually in the office? Do you need more assigned desks, or will shared workstations provide enough space each day? What is the maximum utilization by day or by month? These are just a few of the questions a short-term utilization study can answer. AgilQuest’s method makes it quick and easy, and uses the systems that are likely already in place, to accurately measure the utilization before you get started on any new space project. 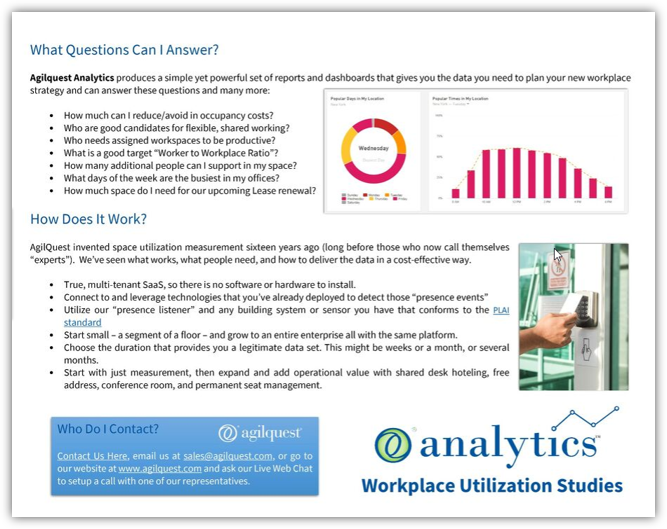 Download this guide to see how AgilQuest’s Utilization Studies work and what questions they answer.